A few months ago I put up a post asking people to guess which states I had visited this summer based on the species names of the ants in the photographs. If you had guessed Pennsylvania for this one, you would have been correct. Camponotus pennsylanicus colonies are found in a number of states throughout the East and Midwest, as well as Pennsylvania (Hansen and Klotz, p. 86). 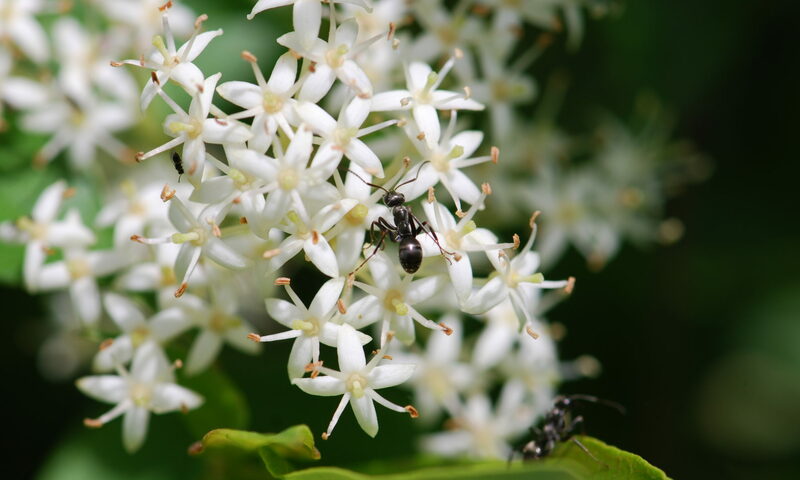 The ants in the photograph are in upstate New York. 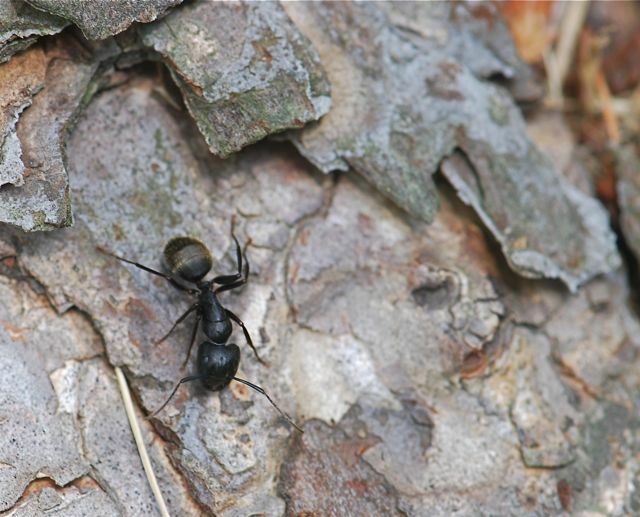 Colonies of these ants are often found in wooded regions and Camponotus pennsylvanicus workers are commonly called black carpenter ants because of their habit of making nests in wood, such as stumps or rotting logs. How do you tell a Camponotus pennsylvanicus worker from this Formica worker? Two characteristics that are relatively east to spot are the long blonde pubescence (hairs) on the gaster (rear section) of the Camponotus. 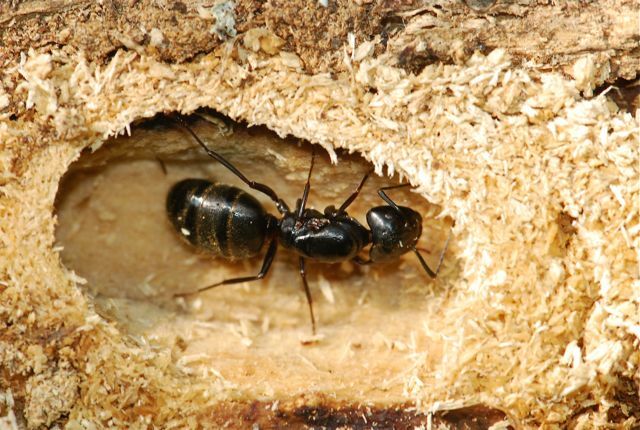 The trunk (middle section) is evenly rounded when seen from the side for Camponotus, whereas there is a notch or valley in the Formica. How do colonies start? The alates fly in the spring, usually on the day of the first spring thunderstorm. After mating, the queen pulls off her wings (you can see the wing scars on the side of her trunk) and starts her own nest, often under the bark of a fallen log like this one. The males look more like wasps. The males die after the mating swarm. The workers are polymorphic, ranging from 6-13 mm in length. 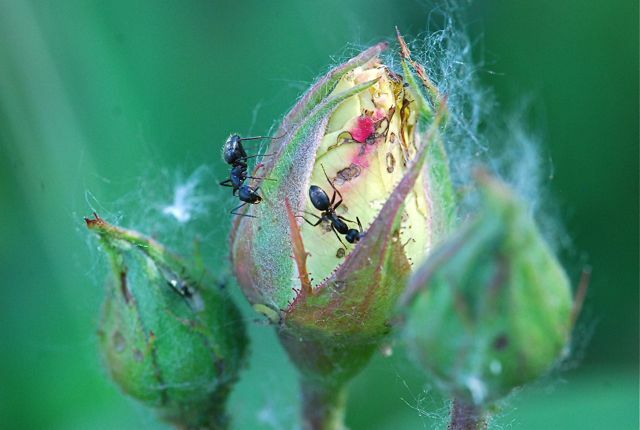 Although the largest workers are sometimes called soldiers, they do much more than defend the nest. They also are involved in nest construction and foraging. 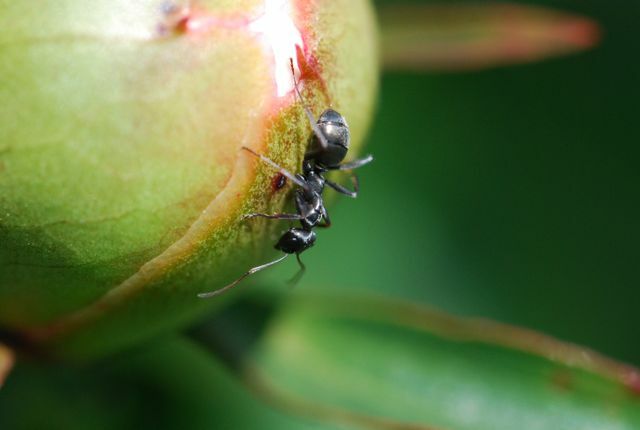 Carpenter ants do not have a stinger, but can bite to defend themselves. The tasty red fruit is a mulberry. 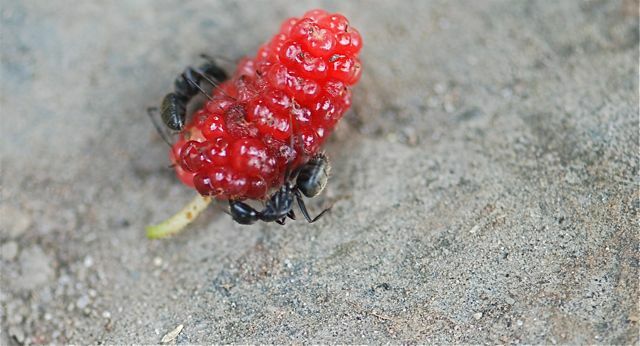 Camponotus workers often gather sweets from fruit, nectaries, extrafloral nectaries, and honeydew from other insects. They also prey on or scavenge a number of different arthropods. 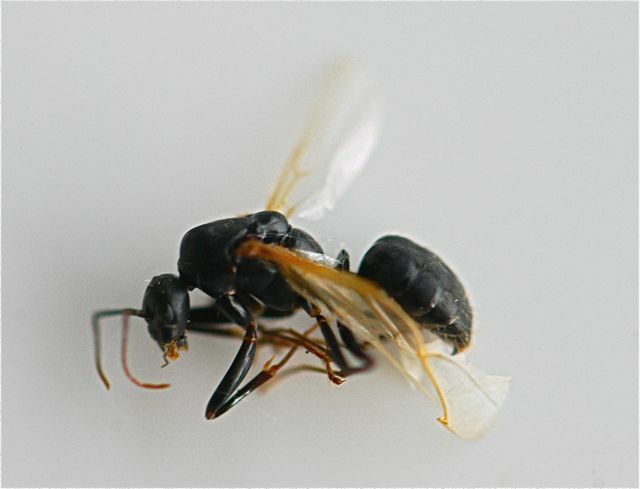 For example, a recent study has shown Camponotus pennsylvanicus to be a predator of the red oak borer, Enaphalodes rufulus, a cerambycid beetle that was associated with oak decline in the Ozarks (Muilenburg et. al., 2008). Unlike harvester ants, Camponotus workers carry virtually all the food back to the nest internally (Cannon and Fell, 2002). I wonder if they are going to find that caterpillar at the base of the bud. 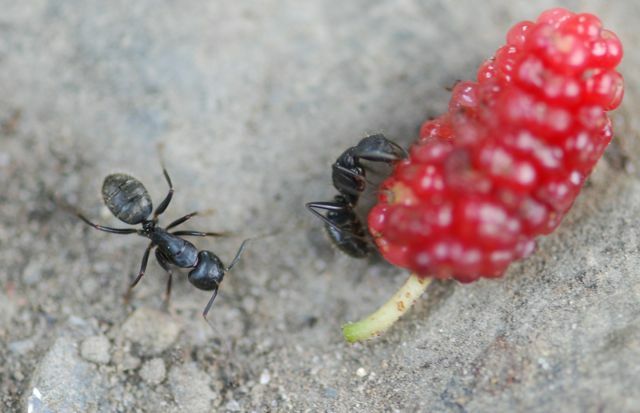 Due to their large size, carpenter ants are much easier to see and study than rover ants! Cannon, Colleen A. and Fell, Richard D. (2002). Patterns of Macronutrient Collection in the Black Carpenter Ant, Camponotus pennsylvanicus (De Geer) (Hymenoptera: Formicidae). Environmental Entomology. 31( 6): 977-981. Muilenburg, Vanessa L., Goggin, Fiona L., Hebert, Stephanie L., Jia, Lingling and Stephen, Fred M. (2008). Ant predation on red oak borer confirmed by field observation and molecular gut-content analysis. Agricultural and Forest Entomology, 10(3): 205-213. Hansen, Laurel D. and John H. Klotz. (2005). Carpenter Ants of the United States and Canada. Comstock Publishing Associates, Ithaca.